We are a group of students at the Penn Graduate School of Education seeking to understand educational opportunity, access and equity in the context of global conflict. We will consider the effects of issues, such as armed and internal conflict, extremism and displacement on the educational opportunities of populations, across Latin America, Sub-Saharan Africa, Southeast Asia, Eastern Europe and the Middle East and North Africa (MENA). This blog is a platform for dialogue concerning education and conflict in the global arena. 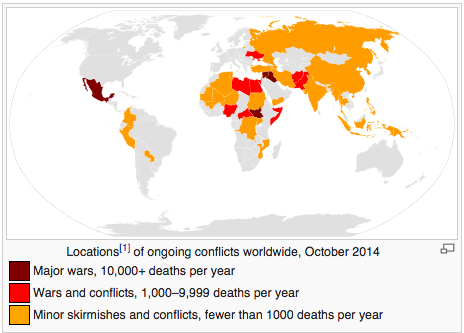 Highlighted areas of conflict are shown below.